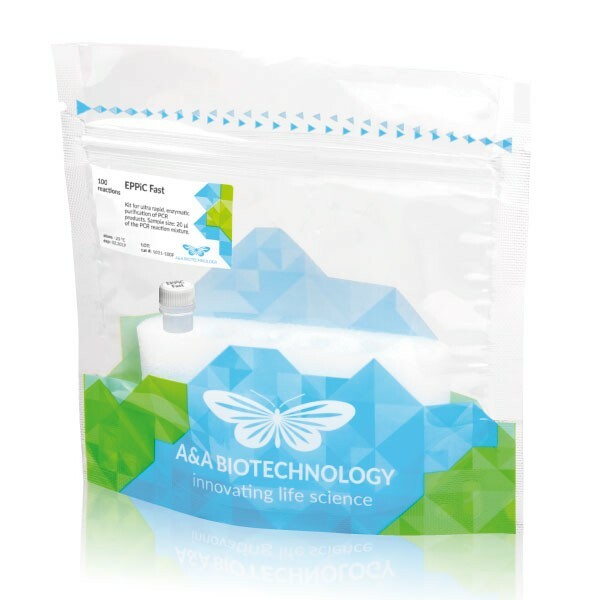 Kit for ultra rapid, enzymatic purification of PCR products. Sample size: 20 μl of the PCR reaction mixture. ffectively degrade dNTPs and primers left-overs from previous PCR mixtures while remaining the double stranded DNA PCR products untouched. The EPPiC Fast enzymes are active at 37 °C in standard buffers used in PCR and are completely thermally inactivated by 1 min at 80 °C incubation. The EPPiC Fast purifed PCR fragments are free from dNTPs and original PCR primers and may be directly used in downstream applications including nested, second round PCR, SNP analysis, molecular cloning and cycle sequencing reactions.